Today Royal Mail is paying homage to the great British comics by issuing ten new 1st class stamps. The Comics issue also marks the 75th birthday of The Dandy, Britain’s longest running comic. 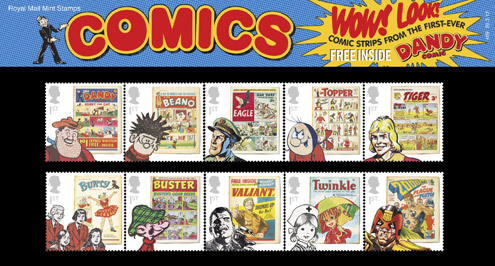 The stamps feature classic covers and iconic characters from comics such as The Topper, Tiger, Bunty, Buster, The Beano and 2000AD. British comics emerged from weekly ‘story papers’ such as Boy’s Own and The Magnet (featuring Billy Bunter), but in December 1937 DC Thomson launched The Dandy, featuring rollicking comic strip adventures with individual speech balloons rather than blocks of text. The Beano followed just over six months later and from that point publishers knew they were on to a winner, with an explosion of titles after the Second World War including The Beezer, Eagle, Mandy and Twinkle. At that time there was a comic to suit every child, but as the decades rolled by weeklies folded or merged as readers lost that weekly habit. The Dandy, The Beano and 2000 AD are still successful and remain in circulation, and their much loved characters, including Desperate Dan, Dennis the Menace and zero-tolerance super-cop Judge Dredd live on in the nation’s heart. The Dandy was first published in the United Kingdom by D. C. Thomson & Co. Ltd in December 1937 and is the world’s longest continuously published comic. Wild-west hero Desperate Dan first appeared in December 1937. The world’s strongest man, he shaves with a blow torch ands eats cow pies complete with the tails and horns. The Beano first appeared on 30 July 1938. The Dennis the Menace strip (now known as Dennis and Gnasher) first appeared in 1951 and is the longest running strip in the comic. Other iconic strips include the Bash Street Kids, Roger the Dodger and Minnie the Minx. The first issue of Eagle was released in April 1950. Revolutionary in its presentation and content, it was enormously successful; the first issue sold about 900,000 copies. Featured in colour on the front cover was Dan Dare, Pilot of the Future, created by Frank Hampson. Other popular stories included Riders of the Range and P.C. 49. Eagle also contained news and sport sections, and educational cutaway diagrams of sophisticated machinery. The Topper was published by DC Thomson Ltd and ran from 1953 to 1990, when it merged with The Beezer. Mickey the Monkey was the original cover star. Beryl the Peril was created by David Law as a female Dennis the Menace (also created by Law). The strip ran from the first issue, taking over the cover in 1986. Tiger was published from 1954 to 1985, and featured predominantly sporting strips. Its most popular strip was Roy of the Rovers, recounting the life of Roy Race and the team he played for, Melchester Rovers. This strip proved so successful it was spun out of Tiger and into its own comic. Bunty was published by DC Thomson from 1958 to 2001. It consisted of a collection of many small strips, typically the stories themselves being three to five pages long. The Four Marys was the longest story. The comic ran from its creation in 1958 to its end in 2001. It centered around four young teenagers who lived in a girls-only boarding school in Elmbury. Buster ran from 1960 to 2000 and carried a mixture of humour and adventure strips. The title character, whose strip usually appeared on the front cover, was Buster. He was originally billed as Buster: Son of Andy Capp, the lead character of the Daily Mirror newspaper strip, and wore a similar flat cap to reinforce the connection. Valiant was a British boys’ adventure comic which ran from 1962 to 1976. It was published by IPC Magazines and was one of their major adventure titles throughout the 1960s and early 1970s. Aside from World War II characters like Captain Hurricane, Valiant ran innovative science fiction strips like the Steel Claw, a scientist rendered invisible by his artificial hand. Twinkle, ‘the picture paper especially for little girls’, was published by D. C. Thomson & Co. Ltd from 1968 to 1999. It was aimed at young girls and came out weekly, Nurse Nancy, who ran a toy hospital with her grandfather, was one of the most popular characters. 2000 AD is a weekly British science fiction-oriented comic, first published in 1977. It is most noted for its Judge Dredd stories, and has been contributed to by a number of artists and writers who became renowned in the field internationally, such as Alan Moore, Neil Gaiman and Grant Morrison. Judge Dredd is a law enforcement officer in a city of the future where uniformed Judges combine the powers of police, judge and jury. 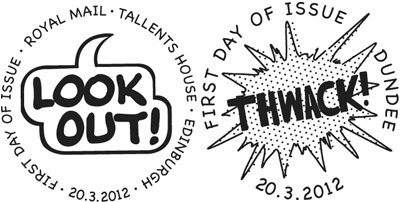 The Comics stamps are now available from Royal Mail Stamps online. Visit the British Stamps pages on our website to find out more about commemorative stamps from 1924 to 1951, and definitive stamps from 1840 to 1970.